China sentenced a man to death and jailed another 28 people for up to life on Tuesday for their roles in a massive slavery and child labour scandal involving scorching brickworks in Shanxi Province. The owners, managers and thugs at the prison-like kilns which the Chinese media said numbered in the hundreds in the northern province of Shanxi were convicted of charges including forced labour and illegal detention, an official said. Zhao Yanbing received the death penalty from the Linfen Intermediate People's Court for accidentally killing a worker on a "black brick kiln" in Hongtong county, at the centre of the scandal. The court also deprived off his political rights. The slave labor scandal erupted last month after hundreds of parents complained their children were being forced to work in brick kilns in Henan, Shanxi and Shaanxi provinces. Zhao, who was hired to supervise workers in the kiln, was found guilty of manslaughter by the court, according to a press conference by Vice President Liu Jimin of Shanxi Provincial Higher People's Court on Tuesday in Taiyuan, provincial capital. Zhao had previously admitted to beating a mentally handicapped man to death for not working fast enough last November. Foreman Heng Tinghan was given life imprisonment for intentionally injuring workers and for illegal detention. Following his arrest last month, Heng famously said about his role in the scandal, "I felt it was a fairly small thing." The boss of the kiln, Wang Bingbing, the son of a local Communist Party village chief, was sentenced to nine years in prison for illegal detention. Twenty-six other employees were given prison sentences. Six taskmasters, convicted of forcing workers to work in brick kilns owned by Wang in Caosheng Village, from March to late May this year, have been sentenced to jail terms ranging from 18 months to three years. The workers had been forced to work overtime without payment. During the period, 18 workers were injured, one seriously, in unspeakable working conditions. A total of 29 brick kiln bosses, foremen, supervisors or taskmasters, tried by courts in different cities and counties of Shanxi in seven separate cases, have been given different jail terms so far, the court statement concluded. Sentences of a further 12 people involved in five cases are expected to be made public in a couple of days, the court spokesman said. China has punished dozens of officials for allowing slave-like exploitation of workers and children in brick kilns, but announced criminal investigations against only six. Reports that hundreds of farmers, teenagers and some children had been forced or lured to work in kilns and mines in the northern province of Shanxi sparked nationwide outrage last month. They endured prison-like confinement and brutal beatings, local media reported. TV news showed released workers with emaciated bodies and festering wounds, and China's leaders promised to punish those involved. Shanxi authorities on Monday announced the results of their investigation. The focus was on low-ranking officials who received administrative punishments, and investigators said they had not found evidence of corruption or collusion. Almost all of the 95 punished were from eight counties in the Shanxi cities of Linfen and Yuncheng. They were sacked, demoted, expelled from the Communist Party or merely received warnings, Xinhua news agency said. The deputy party chief who also served as government head of Hongtong county, at the centre of the scandal, would be fired, said Yang Senlin, a top discipline official with the Communist Party's Shanxi province office. Six Hongtong officials were being probed by judicial departments and faced possible criminal charges, Yang said. "Other than the direct responsibility of the (owners), the 'black brick kilns' incident happened mainly because of lax supervision and dereliction of duty of grassroots party and government officials," Yang said. Investigators had found no evidence of official corruption that many Chinese media reports alleged, Yang said. "After about one month of serious investigation, we haven't found problems of this kind," he told a news conference in provincial capital Taiyuan. Yang said the punishments were unusually harsh. But there was no high-ranking officials among those punished. According to the Chinese laws and regulations, the county and township party organizations and governments are directly responsible for the management and administration of rural brick kilns and rural labor. So the county and township officials were directly accountable to such happenings, Yang said. However, Yang added, the city Party committees and governments in the areas should also shoulder some responsibility, and the Linfen and Yuncheng Party committees and governments have been reprimanded by the provincial Party committee and government, and requested to make profound self-crtiticism. Police have detained more than 130 people, mostly owners of the brickworks, which Chinese media said numbered in the hundreds, and thugs working for them, and more than 500 workers had been released, state media have said. Dozens went on trial earlier this month, but no rulings have been announced. Yang said several officials had been punished in connection with six child labourers freed from five brick kilns. 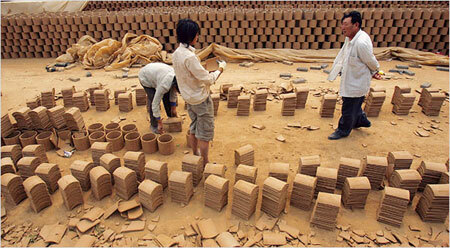 Chinese media have said the number of children confined to the scorching kilns could have been as many as 1,000.